This Product Brief introduces the reader to the Long-Term Pavement Performance Bind (LTPPBind) Online Web-based tool for selecting asphalt binder performance grades (PGs). (1) It explains what the tool is, who can benefit from its use, what its main features are, and how and where potential users can find more information. The current version of the LTPPBind 3.0/3.1 software uses degree days over 10 ºC as the climatic value in a transfer function for high-temperature (HT) PG. (4) The transfer function was developed by taking advantage of the integrated climatic model and the Mechanistic-Empirical Pavement Design rutting concepts. Select binder PGs based on actual temperature conditions at the site and the level of risk designated by the highway agency. Adjust the PG selection for traffic loading and speed. Note: Temperatures are presented in degrees Celsius. Who can benefit from LTPPBind Online? All State and Provincial transportation departments, the highway construction industry, asphalt binder producers, university faculties/students, and researchers will benefit from LTPPBind Online. (1) This new software tool provides pavement engineers with the ability to select binder grades that are less restrictive and more cost effective for allowable rutting. 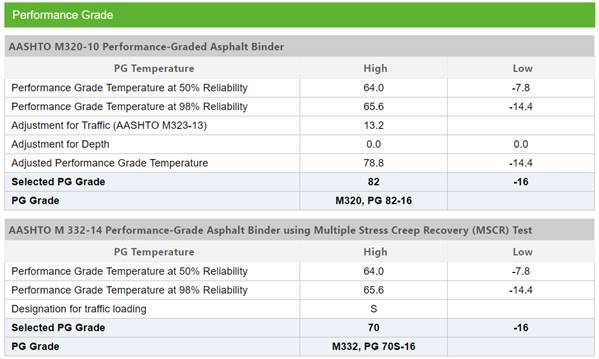 In addition to the high and low temperature PG, users can compare selected binder PGs between AASHTO M320-10 and AASHTO M 332-14 standards. (5,6) Users can select climatic data from MERRA, LTPP climatic data (virtual weather station (VWS) or automated weather station (AWS)), or enter the climatic data manually. MERRA data are selected by clicking on the map shown in figure 2 with the mouse cursor or by entering the coordinates in the search box. LTPP VWS climatic data are selected from a drop-down list of LTPP sections, and LTPP AWS climatic data are selected from existing AWS locations on the map in the United States only. Finally, users have the option of manually entering the climatic information for a specific location based on a credible climatic data source. 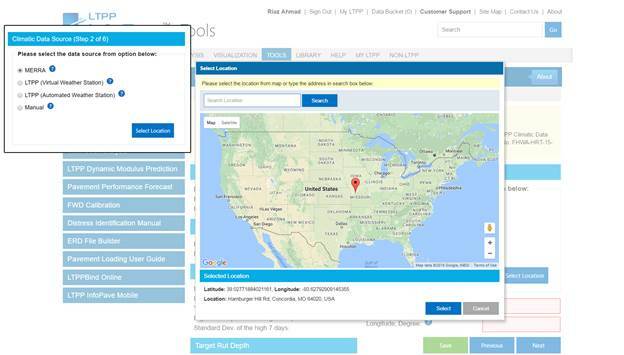 Provides all the parameters used to select a PG for the desired location. Shows the adjusted PG for traffic loading and speed. Provides the high and low performance grade at 50- and 98-percent reliability levels. Can be saved or printed for future reference. FHWA. (2016). Long-Term Pavement Performance Bind Online Tool, Federal Highway Administration, Washington, DC, obtained from: https://infopave.fhwa.dot.gov/Tools/LTPPBindOnline, last accessed December 15, 2016.
iENGINEERING. (2016). LTPPBind Online, Report No. FHWA-HRT-17-010, Federal Highway Administration, Washington, DC. Kennedy, T.W., Huber, G.A., Harrigan, E.T., Cominsky, R.J., Hughes, C.S., Von Quintus, H.L., and Moulthrop, J.S. (1994). Superior Performing Asphalt Pavements (Superpave): The Product of the SHRP Asphalt Research Program,SHRP-A-410, Strategic Highway Research Program, National Research Council, Washington, DC. FHWA. (2005). LTPPBIND, Version 3.1 Beta, Federal Highway Administration, Washington, DC. AASHTO. (2014). Standard Specification for Performance-Graded Asphalt Binder Using Multiple Stress Creep Recovery (MSCR) Test, AASHTO Designation M 332-14, American Association of State and Highway Transportation Officials, Washington, DC. AASHTO. (2014). Standard Specification for Performance-Graded Asphalt Binder, AASHTO Designation M 320-10, American Association of State and Highway Transportation Officials, Washington, DC. NASA. (2015). MERRA: Modern-Era Retrospective Analysis for Research and Applications, Goddard Space Flight Center, Global Modeling and Assimilation Office, Greenbelt, MD, obtained from: http://gmao.gsfc.nasa.gov/merra/, last accessed March 9, 2015. FHWA. (2016). LTPP Climate Tool, Federal Highway Administration, Washington, DC, obtained from: https://infopave.fhwa.dot.gov/Data/ClimateTool, last accessed December 15, 2016. FHWA. (2016). LTPP Infopave™, Federal Highway Administration, Washington, DC, obtained from: https://infopave.fhwa.dot.gov/, last accessed December 2016. For additional information contact Larry Wiser, Office of Infrastructure R&D, 6300 Georgetown Pike, McLean, VA 22101-2296, (202) 493-3079. Researchers―This study was performed by iENGINEERING Corporation. Distribution―This Product Brief is being distributed according to a standard distribution. Direct distribution is being made to the FHWA Divisions and Resource Center. Availability―The LTPPBind Online can be accessed via the InfoPaveTM Web site located at https://infopave.fhwa.dot.gov under the “Tools” tab. Key Words―LTPPBind, asphalt binder, pavement performance, climate data, pavement design. Notice―This document is disseminated under the sponsorship of the U.S. Department of Transportation in the interest of information exchange. The U.S. Government assumes no liability for the use of the information contained in this document. The U.S. Government does not endorse products or manufacturers. Trademarks or manufacturers’ names appear in this report only because they are considered essential to the objective of the document. Quality Assurance Statement―The Federal Highway Administration (FHWA) provides high-quality information to serve Government, industry, and the public in a manner that promotes public understanding. Standards and policies are used to ensure and maximize the quality, objectivity, utility, and integrity of its information. FHWA periodically reviews quality issues and adjusts its programs and processes to ensure continuous quality improvement.